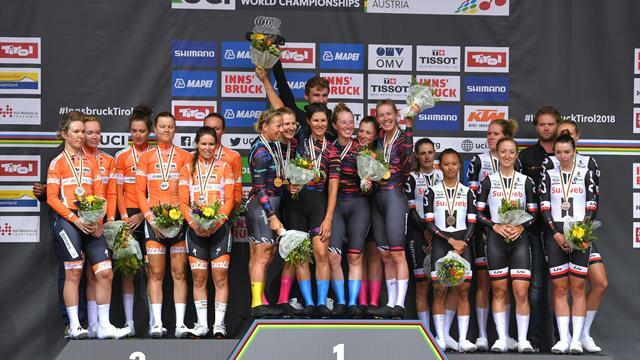 Reigning champions Sunweb were dethroned on day one of the UCI World Championships in Innsbruck as Canyon-SRAM sprung a surprise in the women’s team time trial. The Canyon-SRAM team, featuring British sisters Hannah and Alice Barnes, tore round the 54.5km course in 1:01:46.60. Sunweb, winners in Bergen last time out, were the last team to set off and crossed the line 28.67 seconds in arrears - which was only good enough for third place. Another Dutch outfit, Boels Dolmans, were in second, 21.90 seconds off the time set by Canyon-SRAM. A largely downhill course took the teams from Area 47 in Otztal to the Alpine town of Innsbruck. As well as the two Barnes sisters, German outfit Canyon-SRAM also included Italy’s Elena Cecchini, Poland’s Katarzyna Niewiadoma and Germany' s Trixi Worrack. “For sure it’s really nice,” Worrack said. “We didn’t win one TTT this year so it was a bit of a surprise, but I think only for the others, because we knew what we could do if we had the perfect day – we could finish on the podium or even on top." Canyon-SRAM have the honour of being the last ever winners of the TTT as a trade team - with national teams set to replace them in the format.